Jenson Button is finally victorious, thoroughly deserving victory. Who would have thought at the beginning of the season that Brawn F1 would have had any kind of chance to win the championship. The championship is a great tribute to Jenson who stayed with the team when Honda backed off from F1, agreed to be front-line driver for Brawn F1 despite the pay cut. Hats off to Ross Brawn, to have faith in the team and the car. Honda made a big big mistake by exiting F1 arena this season. When it was time to reap the benefits hard work and R & D that had put in previous 2 years, they unfortunately gave up F1. I was surprised when I learnt that they managed the entire season with just 3 chassis. That’s really cool. Demonstrating that it is possible to do well in F1 with tight budget. I’ve not spoken anything about Barrichello, he too has done extremely well. However I’m not a big fan of Barrichello. Coming back to the race. Force India started the race in the second row along side Trulli. I really hoped Force India would score points this time around. In the last race Sutil spun off and lost 5 places if I remember right. This race was also unfortunate for Sutil, he crashed into Trulli’s car. They had a war of words infront of the camera, Trulli was fined for his behavior. Webber won the race another good result for Red Bull F1 team. 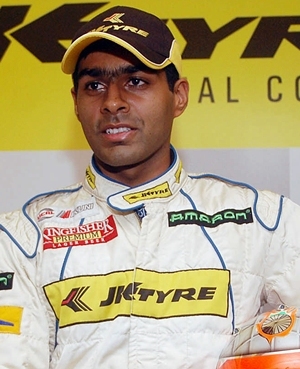 His team-mate also did a commendable job by finishing 4th, he started from 12th position. Looks like Niko Roseberg will replace Barrichello as the Brawn driver, Barrichello is most probably going to fill in Niko Roseberg’s shoes with Williams. Kubica is moving to Renault filling the spot emptied by Alonso. There is still no hint on where Kimi will be driving next season. There is high probability that he might join McLaren team. Toyota has a slot open Kimi might have a chance there aswell. BMW ruled out from the next season, Williams F1 team will use Cosworth engines. Lotus F1 is back into F1 next season. Lots of changes next season, it will be interesting as usual. Jenson Button might be completely disheartened by the qualifying results. He will be starting 13 places behind the his team-mate Rubens Barrichello and a threat to Jenson’s championship dreams. Vettel one more championship contender was eliminated in the Q1 of the Qualifying so was Lewis Hamilton. Force India’s Sutil did well to finish 3rd to start in the second row behind Barrichello and Webber. Sutil has a big job of keeping Trulli and Kimi at bay, both driving cars equipped with KERS. Liuzzi also did well for Force India if not for this crash. Jenson will need some luck to score some points and maintain a good lead ahead of the final race at Abu-dhabi. Barrichello is lighter on fuel this will pose an opportunity to Webber. Anything can happen in tomorrow’s race I do not think the same line-up will win the race in same order. Brazil is in for some action. Apart from this, There was one more interesting move by Kubica to move to Renault next season From BMW Sauber. Its still unclear where Kimi is heading. The race turned out to be a damp squib. All my high expectation fizzed out. Adian Sutil was in good position to score some points for Force India, he was in 9th position, Jenson Button breathing down his neck. However things went bad for Sutil when he spun trying to overtake Heikki Kovalainen. He then lost four positions to end the race at 13th position, ahead of Liuzzi’s car in 14th position. The front runners ended up in the same order as the started. Vettel, Trulli and Hamilton taking podium positions. Kimi finished fourth. Its was in the second half of the race that Kimi actually began to push his car. I seemed as if Kimi is getting into the groove. Its not yet clear where Kimi will be going next season. Alonso moving to Ferarri there is a slot empty at Renault. There are also rumors that McLaren might recall him. It will be interesting if McLaren recalls him, and Alonso joins Ferrari. The best drivers get the best cars, it will be a battle to watch. Button needs one good race to tighten his grip on this year’s championship. With two races to go, Barrichello has a good chance of spoiling Button’s party. Vettel has an outside chance, in case Button does very bad in next two races. 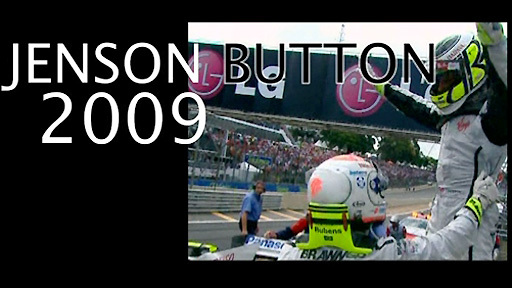 Anyways I want Button to win the championship, for all his hard work and perseverance he has put in all these years. Hoping Button does well in the Brazilian GP. Good performances by Force India in Belgian and Italian GP, re-kindled my interest in F1. Last couple of races the McLarens and Ferraris are performing better than they did in the first half of the season. This is the first time since I began watching F1 that the McLarens or the Ferraris not occuping any of the top two slots in the constructors championship. Brawn-Mercedes sitting pretty on top of the constructors campionship table and Jenson Button and Barrichello of the same team are in first and second positions leading the Drivers Championship table. The Qualifying was accident prone. Three drivers Jaime Alguersuari on Torro Rosso-Ferrari, Timo Glock on Williams-Toyota and Heikki Kovalainen on McLaren-Mercedez crashed. Timo Glock’s accident was serious not sure if will be able to race tomorrow. Every time a car crash red-flag was waved, lot of time was lost in the process. 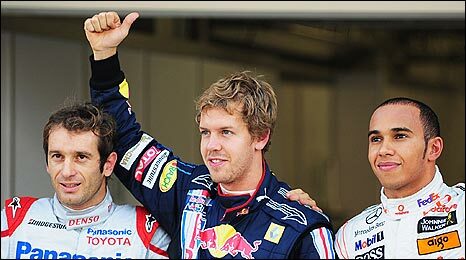 Sebastian Vettel lead Qualifing Red Bull-Renault ahead of Jarno Trulli on Toyota and Lewis Hamilton on McLaren-Mercedes. Force India’s Adrian Sutil ended fourth. However the Brawn pair, Fernando Alonso, Adrian Sutil and Sebastian Buemi are demoted 5 places for failing to slow when yellow flags were waved in a crash-strewn qualifying session [starting grid]. I hope Force India will be able to score some points, and Button be able to keep his championship lead. 2 more races remaining this season Vettel has a slim chance of upsetting Button’s lead. It is interesting to see how this will unfold. Looking forward to watch the race tomorrow.